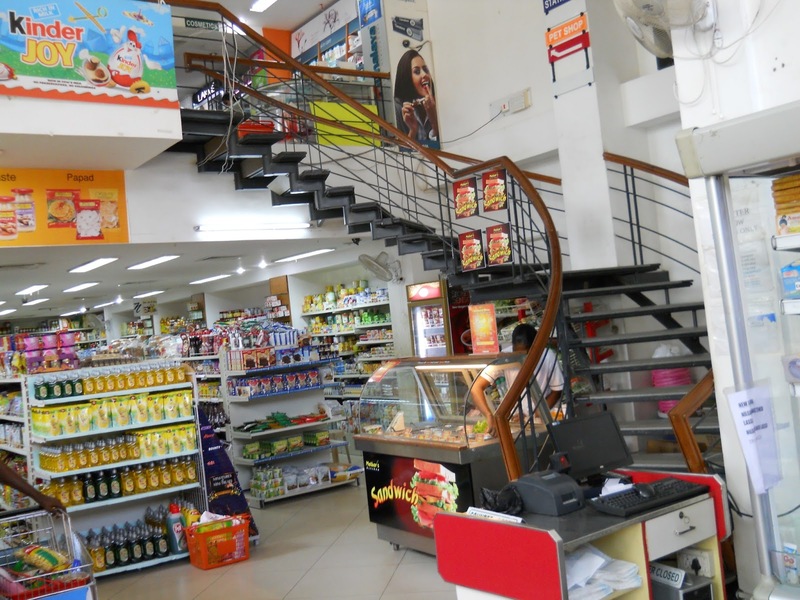 BOBBA CAPS DOXOLOGY: MAR 12, 13 .. WE REVISIT NILGIRIS .. PONDI'S MOST SPECIAL GROCERY STORE ! 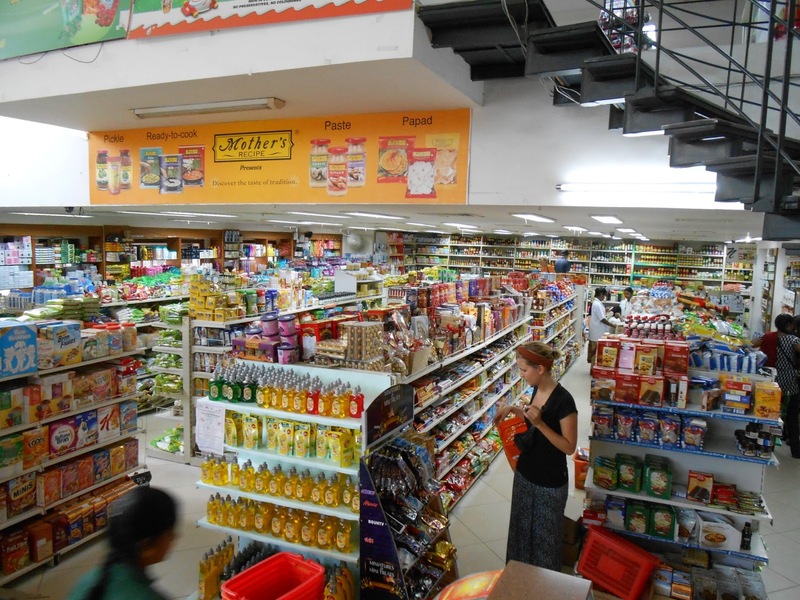 MAR 12, 13 .. WE REVISIT NILGIRIS .. PONDI'S MOST SPECIAL GROCERY STORE ! Gullible 99631 'This one's for you' ! 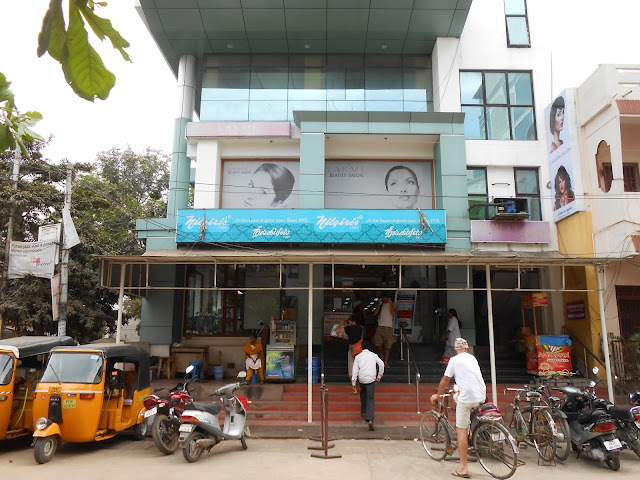 Nilgiris Market is a major landmark for all visitiors to the French Section of Pondicherry! Nilgiris is pronounced .. Nil - Gree (by some employees) and Nil - Greez (by other employees)! Nilgiris is not confined just to 'Pondi' .. with over 90 stores across India's southern states ..Nilgiris IS South India's leading chain of retail stores! As seems the usual case in India, their name is spelled several ways! The sign on the front of the store spells it as Nilgiris. Their cash register receipt spells it Nilgir's. Say it .. Nil - Gree ! Nilgiris has a self-proclaimed nickname of .. Green Field. Of course they spell the word Field as Fieeld and this spelling (Fieeld) is printed formally ON the cash register receipt! OH-MY! And you wonder .. "Cap? What is it you love about India?!" Welcome to my neighborhood of 'Pondi' ! Looking straight ahead you see a blue-green building. This is Nilgiris ! 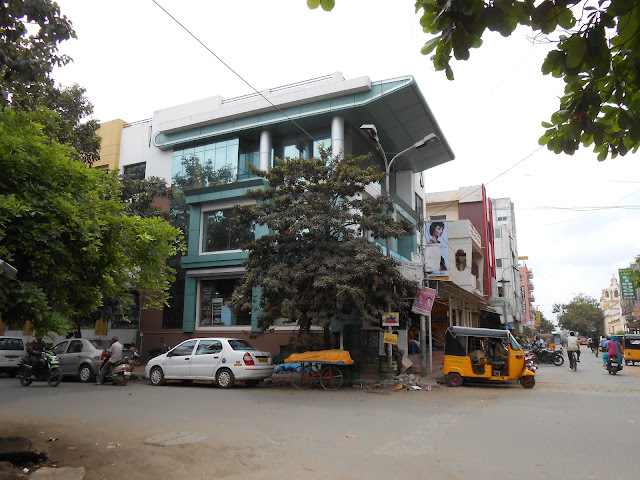 Now I have moved across the above street and in the below photo face Nilgiris straight on ..
Nilgiris truly is more like our super markets than any others I have ever seen here in India ! Nilgiris is shown in the Lonely Planet Tourist Guide as a highlight ! THAT IS SPECIAL ! Nilgiris is open seven days a week from 9AM to 9PM. Now Gullible 99631 .. let's go inside ! What you are seeing in the photo below you might be thinking .."Ho Hum So What !" .. because this is what all of our usual super markets look like ! Patti will tell you all ! "In 1996 with Cap here in India .. I NEVER once saw anything to compare with this !" In my 22+ years of traveling in India .. these photos of this store are totally unique ! This is not-to-say there are no others ! I point out above that Nilgiris is a CHAIN OF NINETY STORES ! 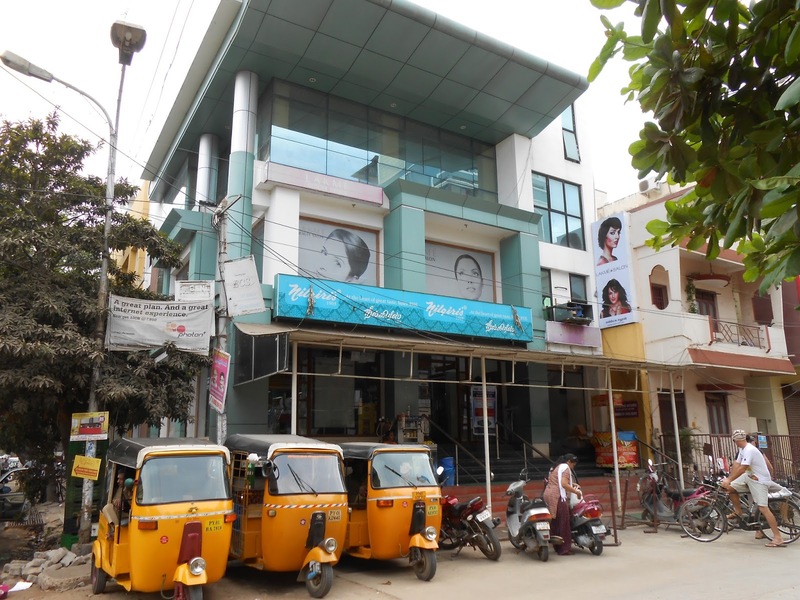 So obviously their other stores must look like this 'Pondi' store ! In the extreme upper right corner of both the above and the below photos you see the stairs leading up to Nilgiris second floor. I have inserted a photo of this stairway two photos below for you to see it more fully. I shot the above photo looking down from the stairs to the second floor shopping level. Here is a photo of the stairway itself! In the below photo we are now upstairs looking at 'general merchandise'. 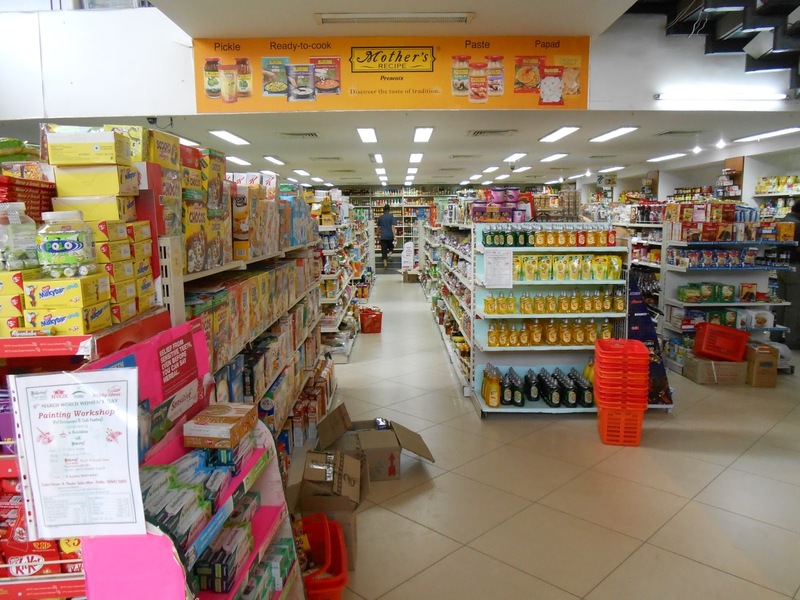 NO this is NOT a United States BIG BOX store but it is far and away the best I have ever seen in India. 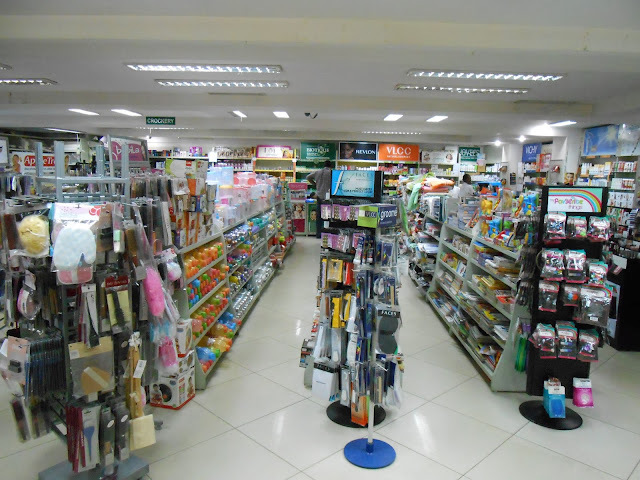 And below I take a 'peek down' at the front of the store and the cash registers. They have a modern-up-to-date 'scanning' system for quicker checking out ! The upstairs shopping area is totally-new-to-me since my visit last January and February 2012 ! 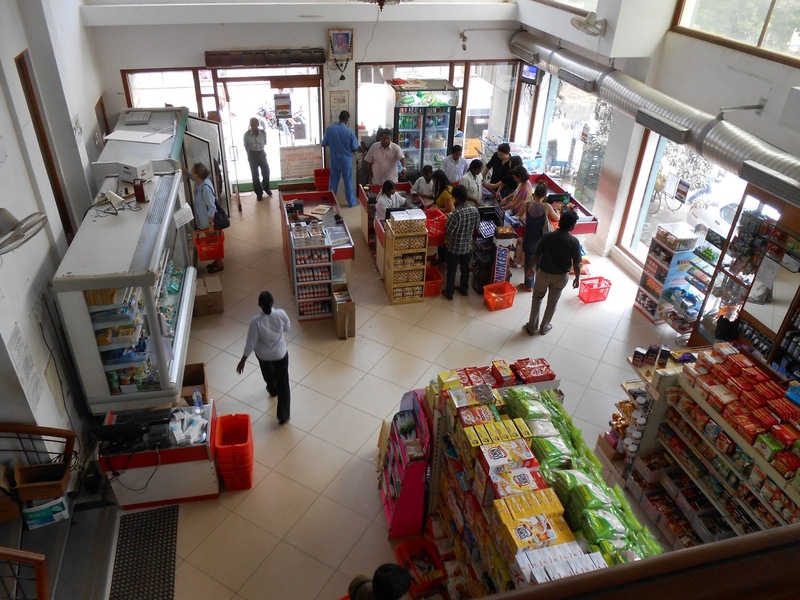 I truly LOVE INDIA and I am SO PROUD of Nilgiris and the state-of-the-art of this 'Pondi' store ! One last look from outside ..
Well Gullible 99631 .. There you have it ! With Much Joy .. Cap .. Okay, thanks, Cap. BUT. I would love to see a little Mom and Pop store with typical Indian supplies. Niligris looks like something in the US. Show us India please. But thanks for your subterfuge in Niligris. I also got busted twice in a food market in the Russian GUM. They couldn't do anything about the photos I took of their window displays, though. There are no such things Gullible .. Little super markets you call Mom and Pop stores. There are other Nilgiris stores and maybe others like Nilgiris that I have not seen anywhere .. this is not to say they do not exist .. I just have never seen them. What I will do is to photograph individual small shops that sell individually what our super markets sell in their one store in one place. A vegetable stand .. a pharmacy .. etc .. I get what you want to see. There are literally hundreds of these tiny shops all operating independently of one another. I want soap I go here. I want a wash cloth I go there. Smiles .. Cap ..
More on this issue Gullible .. Get a map of Pondicherry and put the point of a draftsman's compass on Nilgiris .. Now draw a large circle around Nilgiris .. You now .. within the circle you have drawn .. have a shopping area that has been changed by the existence of Nilgiris .. To get the photos you want I will have to go TOTALLY OUTSIDE of this Nilgiris-influenced-shopping-area that has been changed by the presence of Nilgiris .. I may even have to do this in another city .. maybe Kodaikanal that has a shopping area that has not been so influenced .. Wal-Mart moves in and the local shopping climate changes .. Do you see ? .. Smiles .. Cap .. I've been there once. and I like this store.